2007 was the first year Hublot developed a Big Bang watch specially for the Mexican Football Federation. After the great success of the first model, Hublot has created a new edition of the limited edition timepiece thus continuing its partnership with the Mexican Football Federation. The watch was presented by Hublot's CEO, Jean-Claude Biver to Mexico's national team's trainer Javier Aguirre. Javier Aguirre lead the national team in the 2010 World Cup in South Africa. This new timepiece will accompany the Mexican national team players to South Africa as a symbol of luck. The new Hublot Mexican Football Federation Big Bang has a 44.5 millimeter case sculptured from microblasted black ceramic. The openworked skeleton dial is decorated with red and green details, inspired by Mexico's national colors. The see through case-back reveals a transfer of the FMF logo and is protected by a sapphire crystal. Powered by the Hublot Calibre HUB movement, a mechanical chronograph movement with automatic winding. 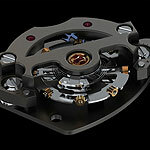 The movement is made up of 252 individual components and has a power-reserve of up to 42 hours. The watch is completed with an adjustable green alligator strap with red stitching. It is water-resistant up to 100 meters. 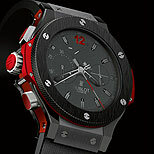 On December 7th, at a celebrity tennis match at Sutton East Tennis Club in New York City, Hublot unveiled its new Bode Bang watch. The celebrity tennis match was to support Bode’s relationship with the Harlem Junior Tennis and Education Program was called Hublot's “Tennis Fusion” Celebrity Challenge. Bode Miller along with 2-time tennis Grand Slam winner Justin Gimelstob, actor Sebastian Stan of TV’s Gossip Girl and Olympian Tim Morehouse played a doubles tennis match, with Hublot Managing Director Ricardo Guadalupe as umpire. This new timepiece is a collaborative effort between the brand and Bode Miller an American skier. The world champion skier was delighted at the opportunity to have a Big Bang watch that bears his name and to divert some of the watch's royalties to the Turtle Ridge Foundation, which was founded by Bode Miller and his family in 2005. The watch is to be a limited and numbered edition of 250 pieces. The Bode Bang is powered by the brands HUB4100 Mechanical chronograph movement with automatic winding which allows for a 42 hour power reserve. The watch is completed with an adjustable black rubber strap with a clasp constructed from steel black PVD. The watch is water resistant to 100 meters. Hublot has officially announced its new movement, which is the first in-house movement for the manufacture, at the opening of Hublot’s new manufacture in Switzerland. 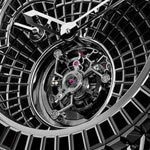 The UNICO name will actually be used to represent Hublot’s new family of Calibers. To start Hublot will be releasing just two calibers for 2010, the first Caliber HUB1240 and the second will be the Unico 1110. Caliber HUB1240 is right now still just a functional prototype but it will be ready for use in 2010. 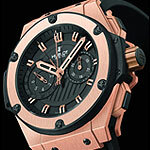 The UNICO movement was designated to be part of Hublot’s new “King Power” models. 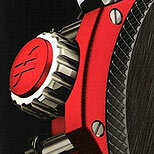 The Caliber HUB1240 is a chronograph movement, composed from 330 parts. 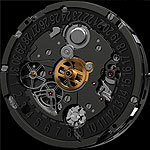 The 36-jewel-movement has a total diameter of 30.40 mm, and is 8.05 mm high. Its functions include traditional hours and minutes, small seconds at 9 o’clock, the date, a 60-second and 60-minute chronograph and offers about 70 hours of power-reserve. The escapement is made from silicon, chosen for its light weight and durable nature. 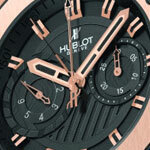 Hublot plans to produce 2,000 UNICO movements in 2010, and approximately 20,000 movements in the medium term. After years of Hublot's partnerships with Wally, the Monaco-headquartered yacht manufacturer, and acting as the Wally Class official timekeeper during their regattas, Hublot has created a new Big Bang watch inspired by the Wally Yachts. This chronograph watch is built from high-tech materials and designed to complement the colors and look of the Wally yachts. The creation of the Wally timepiece is a tribute to the partnership between these two great companies and the values they share. The new Wally watch was selected in the “Sports watch” category of the prestigious Grand Prix de l’ Horlogerie de Genève awards 2009. The Hublot Big Bang Wally is produced in an extremely light alloy of aluminum and magnesium, while the timepieces movement is made of titanium movement. The case, bezel and dial of the watch have all been created in the same color which creates a stylish and sleek looking watch. The dial features a WALLY logo at 9 o'clock position with black indicators for hours, minutes, seconds, date and chronograph. The watch is completed by a black rubber strap. 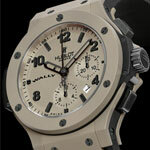 The Big Bang Wally will be created in a limited number of 500 watches. Hublot has unveiled its Gold King Power watch, a watch that is easily recognizable as a Hublot watch with its elegant yet sporty use of rubber and gold. The Gold King Power watch gets its name from the new red gold alloy used in the creation of the watch called King Gold, this new redder and more resilient alloy was developed for especially for Hublot and this is the first time it is being used by the brand. This impressive new limited Edition creation will have a production of only 500 pieces. The case is 48 millimeters in diameter and is produced in the new King Gold. The bezel is made from King Gold as well with black rubber molding and 6 black PVD-coated titanium raised H-shaped screws. The bezel lugs and lateral inserts are made form a black composite resin and the King Gold crown and push-pieces are finished with black rubber inserts. The dial is protected by a sapphire crystal with interior/exterior anti-reflection treatment. The dial is matt black with gold plated micro blasted counters and flange. The gold plated hands indicate the applique gold plated markers for the chronograph hand and hours and minutes. The case is complimented by an adjustable jointed black rubber strap with a King Gold and steel gold PVD deployant clasp. The New Hublot Gold King Power Watch features a self-winding mechanical movement with a split-seconds foudroyante chronograph. 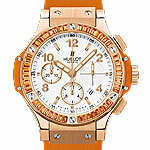 The Hublot HUB 4144 caliber was developed with La Joux-Perret. The polished bridges have a satin-finish with chamfered edges, while the screws are produced form black PVD. The oscillating weight is Tungsten carbide with dimpled surface coated with black PVD. The bottom plate is sand-blasted and rhodium-plated and the escapement has a Glucydur balance spring. The watch features a 42 hour power reserve and is water resistance to 100 meters. 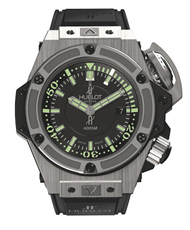 This is not the first time Hublot has created such and expensive timepiece. The first, the One Million Dollar Big Bang, was introduced in 2007 and received the 'Prix du Design' award in the category Jewelry watch. This time, instead of 493 Top Wesselton baguette diamonds, the Caviar features over five hundred extremely rare black diamonds, which have an impressive total weight of 34.5 carats. The Hublot Black Caviar Bang Million Dollar Watch took more than 2000 hours to create and is intended to be a unique creation with only one ever to be produced. The case is crafted from 18 karat white gold and is set with 322 diamonds which account for many of the over 500 rare black diamonds use on the timepiece. The bezel has an additional 179 diamonds, and 13 diamonds have been placed on the crown. The white gold clasp is set with another 30 diamonds. The diamond dial features hour and minute display with rhodium-plated diamond polished skeleton hands, as well as a power reserve indicator formed from diamonds. The exquisite tourbillon movement is visible at the bottom of the dial. The dial is protected by a sapphire crystal with interior anti-reflection treatment. The watch is powered by the manually wound HUB Solo T tourbillon movement, which is comprised of 148 components and has a 120-hour power-reserve. 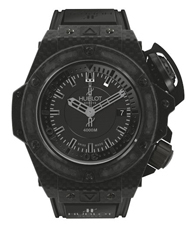 The Caviar Bang is set on the classic Hublot natural black rubber strap. Like Audemars Piguet and the recent introduction of their Royal Oak Offshore Singapore Grand Prix Chronograph, Hublot has created a watch with a split-seconds chronograph that pays tribute to Singapore's Formula One racing event. The watch, the Hublot Project F Bang Big Bang Chronograph, will also benefit the Make A Wish Foundation who's aim is to help children suffering from life-threatening illnesses to realize their dreams. 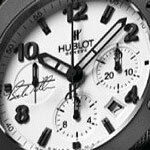 The charity donation is a joint effort between Hublot and the exclusive distributor of Hublot watches in Singapore, Malaysia and Indonesia - The Hour Glass. 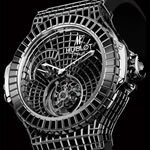 The Hour Glass has pledged 5% of the retail price for every F-Bang Hublot sold in its Singapore and Malaysia locations. The Hublot Project F Bang was created with the intention of launching during the inaugural Sinagapore F1 Race. The watch is a world first, featuring a Split Second-Hand Chronograph with a left hand crown and pushers. It has a 44.5 mm all black ceramic case with red kevlar accents on the sides of the case, and the pushers and crown are black with red kevlar. The bezel is made from black ceramic and the dial is an all black design with the exception of the red 12 at the top of the dial and the split second hand which is red and white. The case is on a rubber strap and has a black PVD-coated steel deployant buckle. 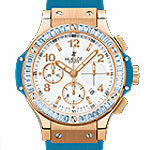 The watch is water-resistant to 100 meters, and will be available in a limited edition of 100 pieces. Hublot has expanded its collection yet again this year by branching out its Big Bang collection to include some very colorful additions. Keeping the same design elements that make the Big Bang so recognizable, Hublot has added a bit of flash to its original design. The Big Bang Purple Carat, Blue Carat and Orange Carat are making their debuts in both 18k red gold and black ceramic versions. 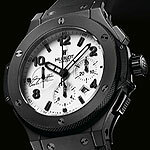 The popularity of Hublot’s Big Bang has skyrocketed since it was first released in 2005. Each year the brand has expanded its production to include new materials such as tantalum and magnesium to augment their original design. The “Carat” furthers the evolution of the Big Bang by introducing a flashy new version, achieved by adding baguette shaped gemstones to the bezel and making their signature rubber strap in these new bright colors. Slightly smaller than the original Big Bang case diameter of 44.5mm, the “Carat” has 41mm case and a polished bezel set with topaz, amethysts or sapphires. The 18k red gold or black ceramic case is 41mm and has a sunken polished bezel set with 48 gemstones (topaz, amethysts or sapphires) approximately 2.23 carats. It has a sapphire crystal with an interior anti-reflection treatment. The dial is white or black with satin finished gold-plated markers. Faceted, diamond polished hands with a white luminescent feature. 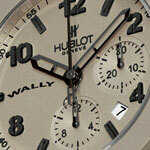 It has a mechanical chronograph movement with automatic winding, Hublot HUB 41. It has a 42 hour power reserve and is water resistant to 100 meters.